Judaea, First Revolt. Shekel, 13.95gg. (11h). . , Year 5 = 70 CE. 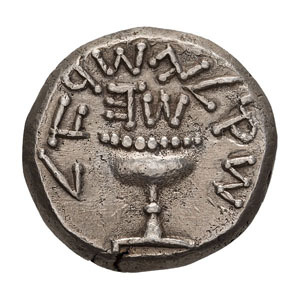 Obv: Chalice with pearled rim, base is raised by projections on ends; Hebrew "Shekel of Israel" around, date (Year 5) above chalice. Rx: Stem with pearled bottom and three pomegranate buds; around Hebrew "Jerusalem the Holy". Hendin 1370a. 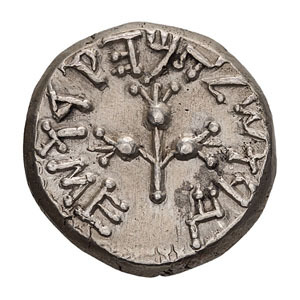 This is one of the rarest coins in the Jewish series and one of the most highly desired. 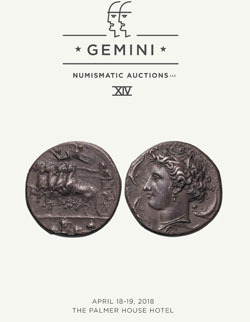 Several of these coins have come up recently, all declared as the "finest known", but they don't compare in any way to this exquisite coin. Perfectly struck and centered. Virtually Mint State..
From the Baldwin's group of thirteen Year 5 shekels, all from the same dies as the previously unique example in BM: see Hendin's note to his no. 1370.